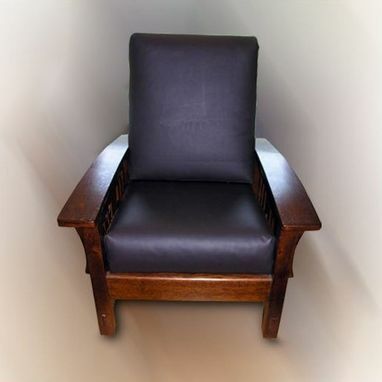 Richard says, "When I make Morris chairs (originally designed by William Morris of the early 1900s), I make them pretty much the way they were made originally. I use full mortise and tenon joinery including through mortises on the legs. They can be made out of any wood but quarter sawn white oak was the mainstay of the chair originally, and I like to use that, but will use red oak as it's a bit easier to come by. I like to choose and saw the wood carefully when making a piece of furniture. Cherry, different Maples, Walnut and other woods can be used too. I don't use any plywood and only use screws to ensure the seat frame stays in place. The back is adjustable through moving Oak dowels. The cushions are made of leather from Wisconsin, but are sewn locally. The chairs are finished with a hand rubbed natural mixture; good for the wood and give it a very nice feel"